My rhubarb is pushing up through the earth in my garden which means it’s high time to use up last year’s frozen rhubarb. It’s also time to work through the remaining jams and compotes I put up each year. My jams are really more like compotes–not very sweet and a bit looser than regular jams. I have long used these fruit preserves to sweeten, thicken and flavor desserts, from crisps and crumbles to pies, cobblers and tarts and coffee cakes. This weekend I added 1/4 pint each blackberry lime jam and Italian prune compote to frozen rhubarb for a simple crisp. I reduce the sugar I would have added to the fruit a little and I get more flavor, color and lovely syrupy fruit. You could use most any kind of fruit, frozen or fresh and any kind of fruit preserve. I still have frozen peaches and may make a cobbler with those and some raspberry jam. Use what you have. I don’t think you can go wrong! 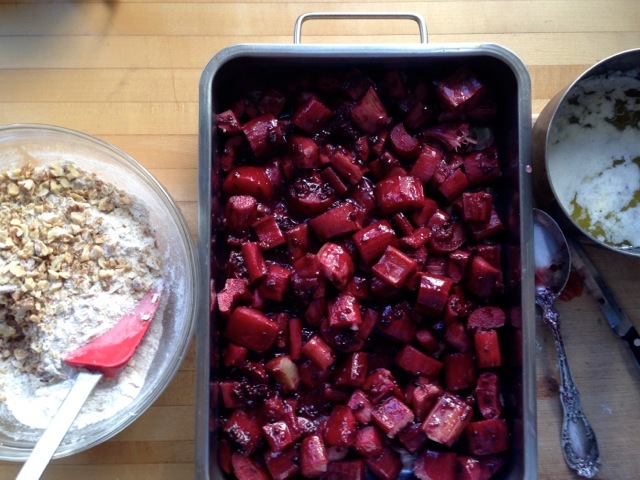 1/2 -2/3 cup sugar (more if you like your desserts on the sweeter side–this will be quite tart if using rhubarb). And the amount of sugar will also depend on how sweet your jams are–if quite sweet reduce the sugar a bit. In a medium bowl combine all the dry ingredients well and then stir in the melted butter and press everything together with your fingers to get varied size crumbs and then set aside. In another bowl mix the cornstarch and sugar and cardamom, if using, and preserves (s) together and add to the fruit. Toss well to evenly mix. 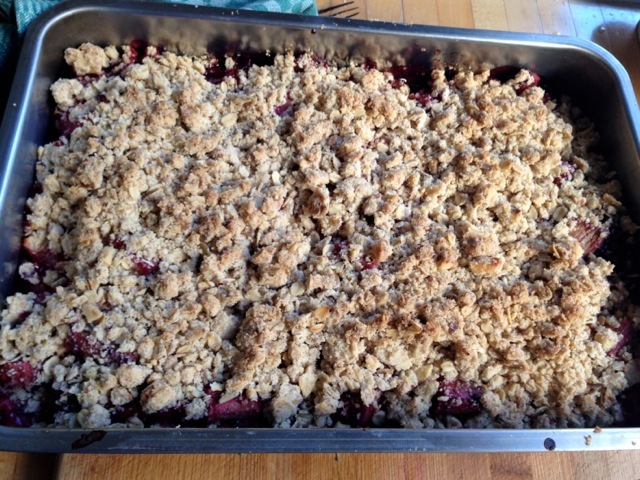 Put the fruit mixture in a 9 x 13 pan and top evenly with crumble mixture. Bake for 35 – 40 minutes, or until the topping is nicely browned and the fruit juices are bubbling and syrupy. Cool for about 20 – 30 minutes before serving.